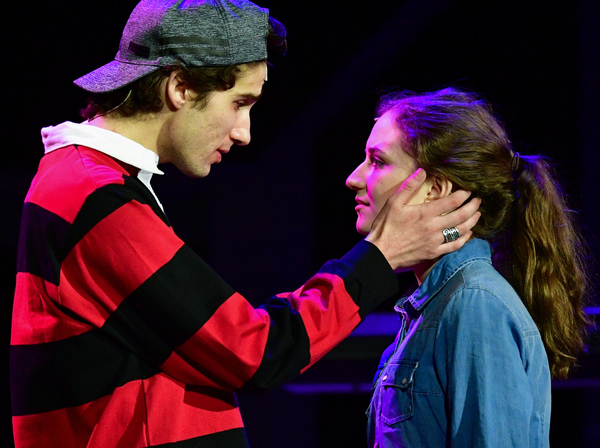 NEXT TO NORMAL, Media Theatre, through February 25 — Krissy Fraelich’s riveting central performance blends with the perfection of Geoffrey Goldberg’s direction to make this production not only powerful and poignant. It might be the best ever in Media Theatre’s history, and that’s saying a lot considering some of the outstanding productions Media artistic director Jesse Cline has mounted in the past two decades. The key to Goldberg’s “Next to Normal” is normality. Goldberg and his cast don’t exaggerate or heighten anything. They play the emotion of a typical family facing a dilemma, so there are difficult and intense moments to face, but the overall quest of the characters played by Fraelich, Ben Dibble, Molly Sorenson, and Ronnie Keller are striving toward balance. The beauty of Fraelich’s remarkably moving performance is how everyday and struggling she can be as Diana, a woman who has been shocked into bi-polar behavior and other mental illness by the death of her infant son, while she gradually and knowingly slips her moorings from stability to another bout of delusion and lunacy. It is Fraelich’s humanity, and our compassion for it, that drives this production. As opposed to playing a crazy lady milking her condition to the dramatic hilt, Fraelich is an average woman who yearns for responsibility but can’t get over the horrible trauma of her life and seeks it like any addict who gets comfort from his or her self-destruction. I’ve often said Krissy Fraelich does not have a dishonest bone in her body, on stage or off, and the sincerity to get well she shows as Diana, sabotaged by her unwillingness to give up, and therefore kill, the son he has nurtured to age 17 in fantasy, conflict in a heart-wrenching way the sympathetic Fraelich might be the only actress to pull off. I praise so lavishly because I have seen ‘Next to Normal” four previous times and have always found it problematic, even when productions were in control and resisted the temptation to be overwrought or give too much attention to the constant ringers and overkills book writer Brian Yorkey and composers Tom Kitt (music) and Yorkey (lyrics) foist on their work, and its audience. As with the current Broadway hit, “Dear Evan Hansen,” there are self-consciously dramatic bits I think are meant to artificially stir the emotional pot more than they move the plot forward. The trick ending of “Next to Normal” especially upsets me. PASSING STRANGE, Wilma Theater, through February 18 — For the last couple of seasons, from “Hamlet” to “Antigone,” to this year’s earlier “Blood Wedding,” the Wilma has worked to redefine theater by adding motion and companion arts to its productions. “Hamlet” and “Rosencrantz and Guildenstern are Dead” infused some of the extra elements well while “Antigone” and “Blood Wedding” were overwhelmed by them to the point of being rendered inert under the strain of the extraneous. Finally, in Tea Alagić’s delectably enthralling production of Stew’s “Passing Strange,” everything Blanka Zizka says he wants for the Wilma has come into place. For once, style coheres to the material, movement matches moment, and all comes together in a lively, telling tale of a young, sensitive black youth searching for his identity in places that aren’t his gang-ridden South Central L.A. This is a musical of discovery in which one finds identity may be individual and only informed by ethnicity and background and that there are parts of home and of our family roots that should not be denied no matter our feelings when we may be too immature to realize our entire picture or want to seek something that might need to be created instead of found. “Passing Strange” works on every level, and this production, an expansion of the Broadway original via reassignment of some parts and different emphasis on some sequences mines all the gold Stew, Heidi Rodewald, and Annie Dorsen developed about a decade ago. Music is one core of the show, and the various sounds, all smacking of originality, set scenes and give performers like narrator Kris Coleman and ensemble member Lindsay Smiling the chance to create some thunder. “Passing Strange” is also a young man’s journey. Jamar Williams excels as the South Central kid who sees life in Europe as his salvation and has significant, evolving adventures in Amsterdam and Berlin before he makes some decisions about the man he wants to me. Williams is like Alagić’s production. He deftly handles all that comes his way, whether it’s raising the roof in a musical number, dancing up a storm, joining the ensemble in a production number, or conveying a character in search of manhood on his own terms. Alagić keeps all moving fluently and with clarity and excitement. 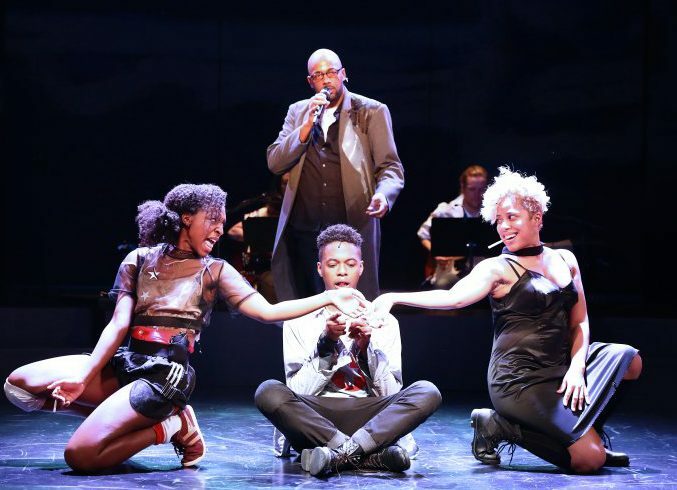 Whether Coleman is narrating, the ensemble is working as one to create a mood or show Williams’s Youth a slice of life, or Kimberly S. Fairbanks is tearing at our emotions as Youth’s mother, “Passing Strange” remains a satisfying show that never flags in variety or depth. You want to know what is going on is Youth’s journey, and you want to experience his revelations with him. The show and the production are both great. Alagić’s ensemble is uniformly entertaining and makes the most of all opportunities. This group includes Smiling, Anthony Martinez-Briggs, Taysha Marie Canales, Fairbanks, and Savannah L. Jackson, Props also the band made up of Amanda Morton, Ben Diamond, Jake Hager, and Ellyn Heald. This entry was posted on March 22, 2018 by nzoren in Theater Reviews and tagged Amanda Morton, Annie Dorsen, Anthony Martinez-Briggs, Ben Diamond, Ben Dibble, Ben Kapilow, Brian Yorkey, Christopher Infantino, Constantine Baecher, Ellyn Heald, Geoffrey Goldberg, Heidi Rodewald, Jake Hager, Jamar Williams, Kimberly S. Fairbanks, Kris Coleman, Krissy Fraelich, Lindsay Smiling, Media Theatre, Molly Sorenson, Next to Normal, Passing Strange, Patrick Ludt, Ronnie Keller, Savannah L. Jackson, Stew, Taysha Marie Canales, Tea Alagic, Tom Kitt, Wilma Theter.